as a refreshing pick-me up on a bike ride or hike. 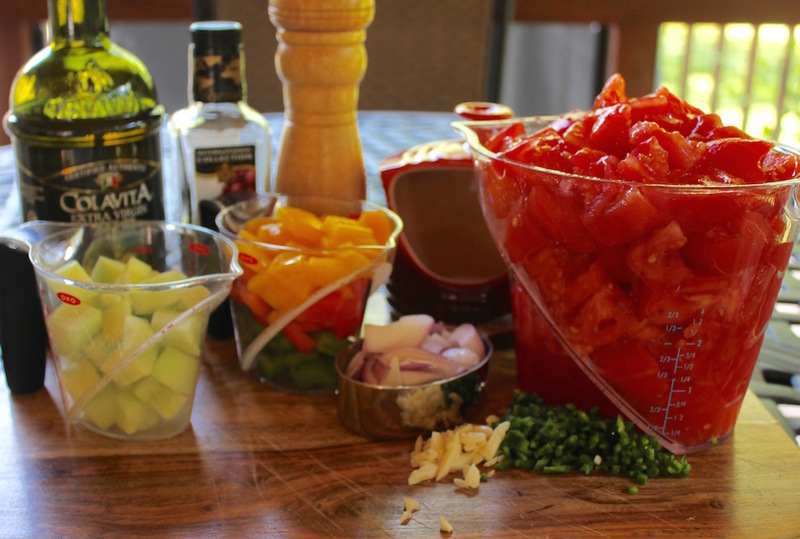 Gazpacho is a cold Spanish soup that originated in the southern region of Andalusia. The primary ingredient is ripe red tomatoes. The most common additions include bell peppers, jalapenos, garlic, onion, olive oil, Sherry wine vinegar, salt and pepper. The traditional Gazpacho Andaluz contains bread soaked in water and pureed with the rest of the vegetables, which makes the soup thicker and heartier. The soup can be pureed to a smooth texture and further refined by using a food mill to remove any remaining skins or seeds or less processed for a chunkier texture. I tried a few variations on the texture before I was satisfied. My first go round I not only peeled the tomatoes but seeded them as well. I have to admit to have feelings of guilt as the luscious red pulp that surrounds the seeds went to waste. I also pureed all the vegetables. I think losing the pulp made the soup less flavorful and I wished for more texture in the soup. I finally settled on pureeing all the tomatoes with one half of the bell peppers, red onion and cucumber and all of the jalapeño and garlic. Do this step in batches, using one-third of the tomatoes and vegetables each time, the juice from the tomatoes helps get an even puree. Vegetables on the right are pureed with the tomatoes in batches. 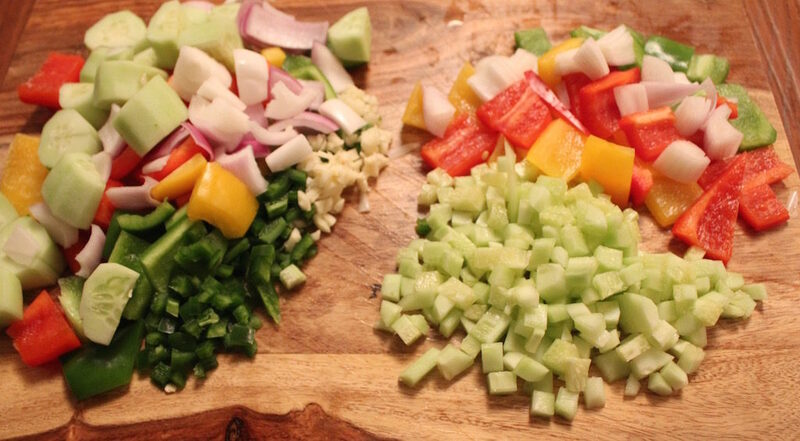 The vegetables on the left, pulse to chop into small pieces. The remaining bell peppers and red onion I pulsed last to chop them into small pieces. I left the cucumber out fearing it would turn to mush and diced it by hand. I used Kirby cucumbers from the farmers market, which were small, sweet and had small, fine seeds. If you use a cuke with large seeds, scoop them out before dicing, they’re bitter. Serve the soup well chilled and choose from a variety of possible garnishes: croutons, minced vegetables, avocado chunks, cooked shrimp, cilantro or pesto oil. Try this quick and easy recipe for gazpacho, a cold tomato vegetable soup that’s perfect for lunch or dinner. Puree the tomatoes, cucumber, onion, bell peppers, jalapeño and garlic in batches using one-third of the ingredients for each batch. Pour into a pitcher or serving bowl. 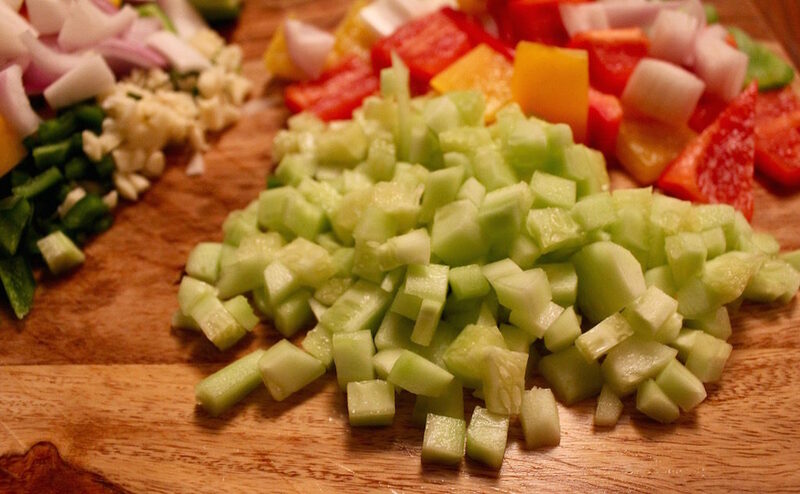 Pulse the onion and bell peppers until coarsely chopped. Add to the soup. Stir in the oil, cilantro, vinegar, salt and pepper.